A work at Sunderland Museum & Winter Gardens was recognised to be similar to a work by Probst at The Cooper Gallery titled ‘Leaving the Mass’. 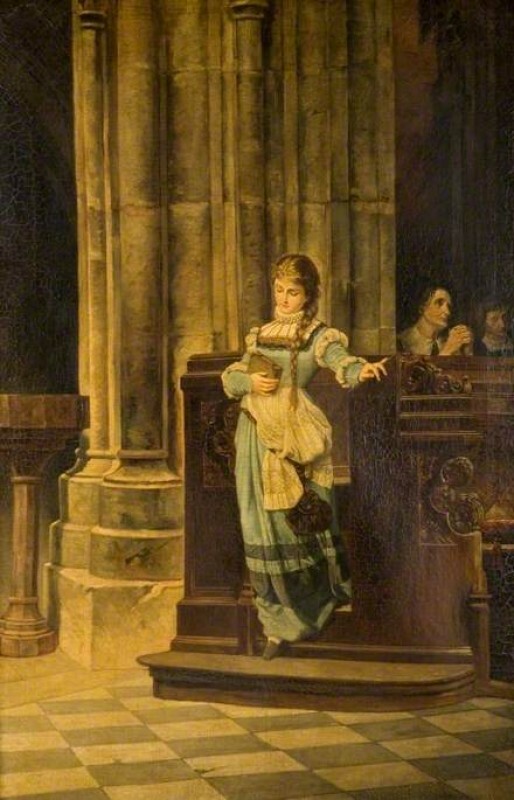 The title ‘Marguerite Leaving the Cathedral’ appears on the original nineteenth-century frame of the Sunderland work, was presented prior to 1906 by an anonymous donor. Art Detectives agreed the work at Sunderland appears to be a copy or version of Leaving the Pew by Carl Probst in The Cooper Gallery, on which Probst’s signature appears on the lower-left corner. No such signature was found on the Sunderland painting. 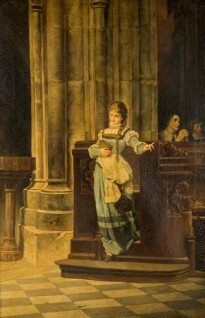 Andrea Kollman found that Probst exhibited a painting in 1877 in the Künstlerhaus in Vienna, described in press as being titled Nach der Messe (‘After Mass’). Sunderland Museum & Winter Gardens’ painting is now titled 'After Mass' and the work listed as being after Carl Probst (1854–1924). Is 'Marguerite Leaving the Cathedral' after Carl Probst (1854–1924), or could it be by Probst?